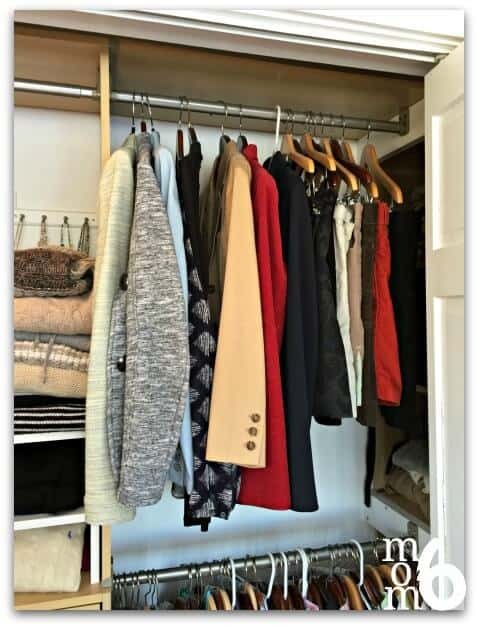 How to Clean Out Your Closet- in 5 Minute Bursts! I own plenty of items that are “perfectly good” but I hardly ever wear… favoring the same items over and over. But I don't want to get rid of these things I am not wearing… because I just might change my mind! I have no time for a big closet organization project right now! However, the grey-sweater-search taught me that it was time to do SOMETHING! So I decided to tackle my closet clean-out in short 5-minute increments over the course of an entire day- working on just one shelf, hanging bar, or drawer at a time, and then walking away to get other things done. I also decided that I needed an “interim storage plan” for all of the items that I am not currently using, but aren't sure that I am ready to donate either. 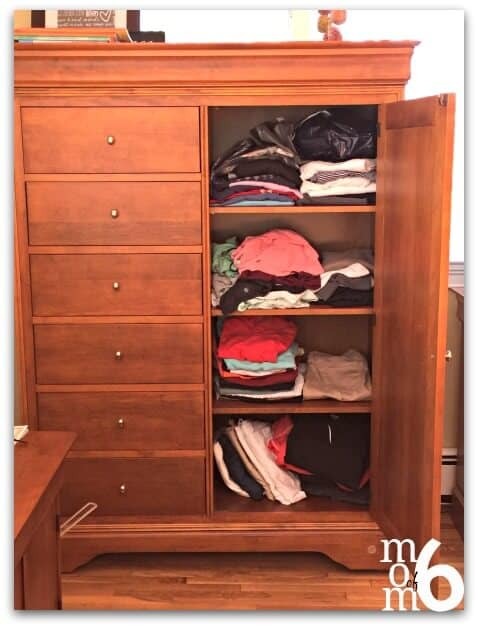 So here's how I did it… How to Clean Out Your Closet in 5 Minute Bursts! 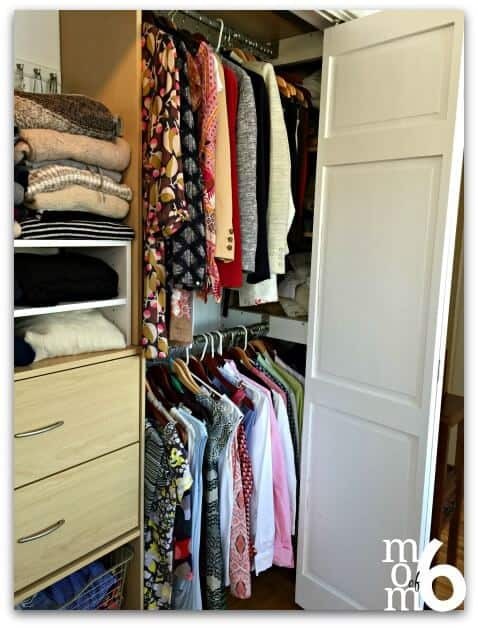 Okay- maybe not battle exactly… but before you start grabbing items out of your closet and just dumping them all onto your bed, it helps to take a few moments and gather together a few tools. 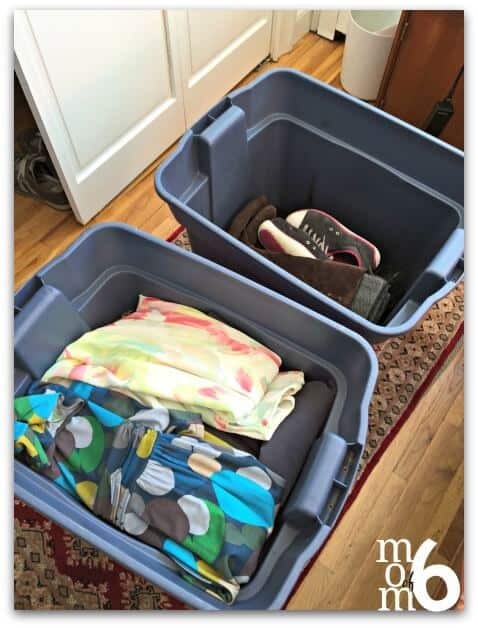 I grabbed two large empty storage bins from our garage and wiped out the insides so I could pack away the clothing that I am not quite ready to part with. 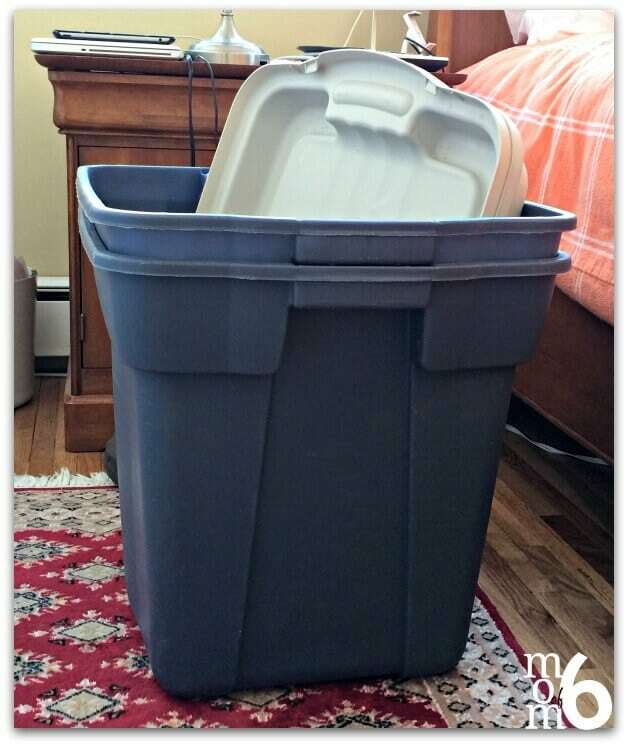 I snagged a few drawstring garbage bags to pack up donation items… AND I went online and scheduled a donation pick up for next week. Now I was ready to begin. 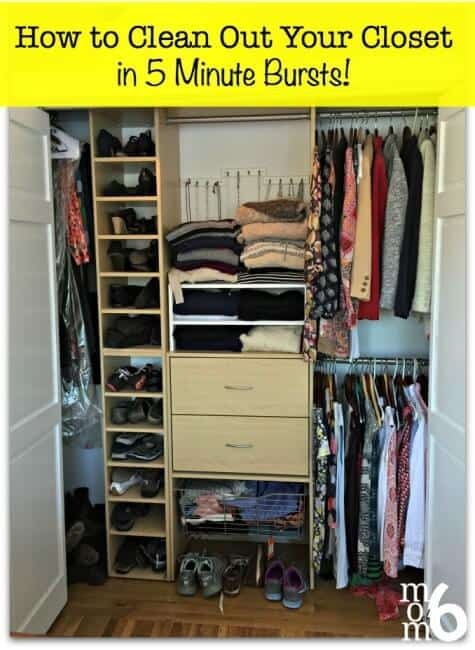 and pick a small section of the closet to start. I chose my top hanging bar. I briefly touched every item and made a decision- if I wear it regularly- it stays. If I like it and think maybe I might like to wear it “someday”, it came off of the hanger, was folded neatly and placed inside of the storage bin. If it is no longer my style, is too worn, or just not something I like anymore, it goes right into the donation bag. In just 5 minutes, I cleaned out the one hanging bar…. and then left my room to bake cupcakes for my daughter's birthday party! in five minute increments. 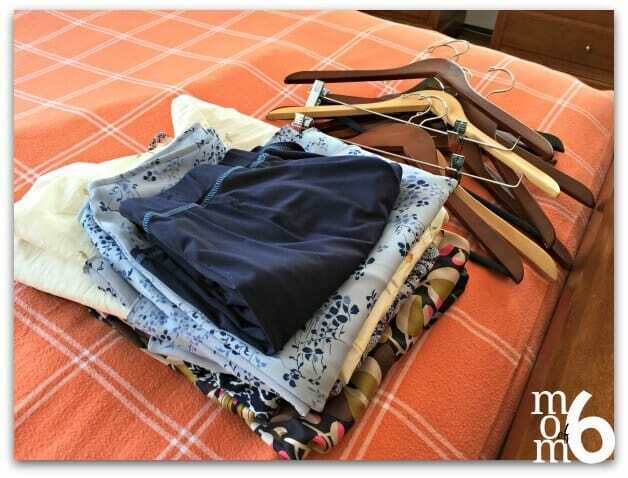 Not only does it feel less overwhelming to clean out your closet in small “bites”, but you end up making better decisions about what to put into storage and what to donate. And since you see the progress you are making, you are motivated to return to it! And I had two bins stuffed full of items that I may or may not ever wear again. Now I know that some people would say that in three months if I haven't gone looking for any of those items that I should just donate them without ever looking at what's in the bin. But I am guessing that I will actually sort through the bins, donate some, and store a smaller subset a bit longer before it all goes away. However, the very fact that these things aren't cluttering my closet makes me feel so much more organized- and I am able fto ind that grey sweater I was looking for! Next up? Tackling my chest of drawers! What do you think? 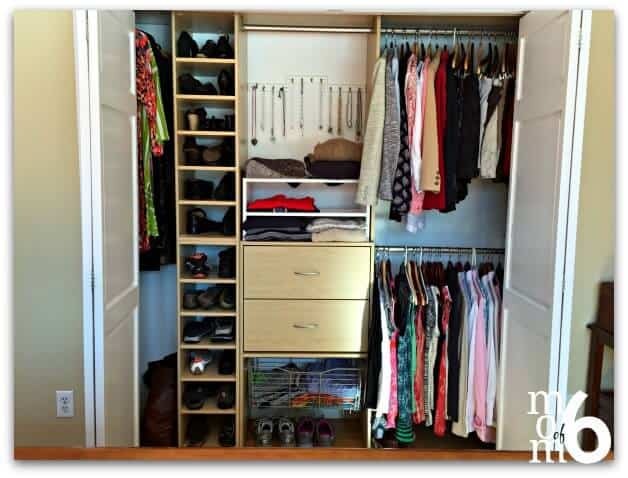 Are you ready to tackle your closet in 5 minute bursts? You can DO this! « Decorating for Easter With Plastic Easter Eggs!